In one of my favourite fantasy novels, Thief of Time by Terry Pratchett—this relates to The Unfolding Journey, I promise—two people are sitting in a beautiful landscape magically removed from the normal world. There is wind and sunlight in the trees, a river gurgles peacefully near by, peacocks stroll up and down the grass. There’s more, and I urge you to read it: even as a staunch atheist, Terry Pratchett’s writing can inform your views on religion and life. But this is the heart of it: sometimes it’s good to focus on the mundane details of real life, and sometimes it’s good to close your eyes and lose yourself in the impossible. In The Unfolding Journey, Sr. Jean Marie Dwyer brings together two vastly different people. Meister Eckhart was a gifted administrator and a ‘punster’ as well as a mystic, poet and philosopher; Etty Hillesum faced the anxieties of modern life as well as the horrors of Auschwitz and the Holocaust. But both of them faced the same journey: moving from within to without. Detachment is not about withdrawal, about completely cutting one’s self off from the world, but about (as Eckhart puts it) equanimity: accepting all things, both good and bad, as God’s grace. As Dwyer puts it: “The only important thing is to be where we are called to be—simply to be who we are, without comparison or competition with others. To be who we are is the best of all gifts.” To go back to the metaphor in the first few paragraphs, neither character is wrong: the peaceful little valley does need to be tended and cleaned up and taken care of, and it is a perfect moment. The Unfolding Journey is an absorbing book: it was a slow read for me at first, but a richly rewarding one in the end. It will challenge the way you view Christianity, and how you see life’s problems and their solutions. It is a fascinating read, and a valuable one for everybody going on their own journey. 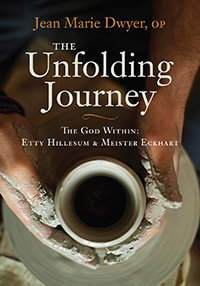 Order The Unfolding Journey today and receive 30% off at $10.47. Apply promotion code Unfolding before checking out. Hurry now and save! Offer expires Monday, October 6th!